Take on the role of Bob, a janitor from a space station near Earth, as he accidently gets sucked into a black hole and transported to a remote part of space. No human has ever been here, so you are on your own. 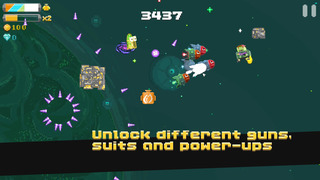 Fight against alien enemies and destroy them before they outnumber you. Conquer their big bosses and unlock new suits and weapons. From one galaxy to the next, dig your way back home! by Red magnet Studios B.V.